Your job, your pension, or your home. This is the choice left to several families in Harvey, Illinois. They can’t have all three and some don’t even have the choice of one. The financial disaster in Harvey is a wake-up call to all Illinoisans that have been forced to hand over their hard-earned incomes to a political ruling class that is willing to leverage their homes and waste tax dollars to fulfill their own political agenda instead of serving the people they are supposed to be representing. The City of Harvey cannot afford to pay its bills and their employees so they were forced to cut 40 public employees from the police and fire departments. The city has an unemployment rate over 20%, effective property tax rates are over 5%, despite home values declining at an alarming 80% over the last 10 years. Harvey families, homeowners, workers, and business owners have paid out nearly $25 million in pension benefits to 42 retired firefighters who have only contributed a collective $1.14 million to their retirement fund. The math to solvency doesn’t work. To make matters even worse the State Comptroller’s office, according to state law, can garnish city revenue to keep up with pension payments. This has let essential services go untouched and the city unable to serve its most vulnerable population. 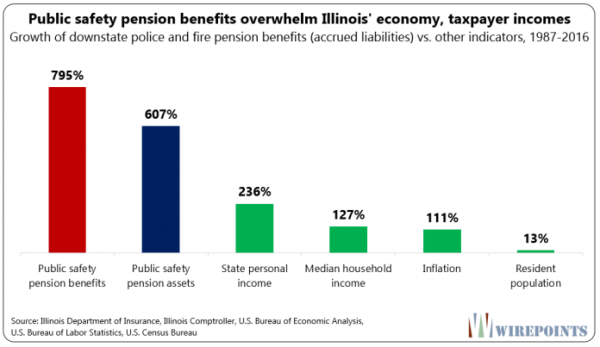 The irony of the state having to step in to control local pension payments when the state’s pensions are roughly $130 billion underfunded is yet another embarrassing example of how Illinois has become one of the worst governed states in the country. Who is standing up for the families in Harvey? Is it Democratic Mayor Kellogg who has been under investigation multiple times for insider deals and fraud? Democratic Cook County Commissioner Toni Preckwinkle who supported Democratic Cook County Property Assessor Joe Berrios who was exposed for his corruption in assessing property values to benefit the rich and punish the poor? The Democratic majority in Springfield that has been propping up Ponzi schemes for years unchallenged and being held to no standards? The situation in Harvey is not unique and is an ominous case study for the path that the state and other communities are moving towards. Overall, nearly two-thirds of Illinois’ 651 pension funds got less than their required contribution from their cities in 2016. The Illinois Opportunity Project has long been an advocate for reforming the pension system and shifting state-funded pensions to a 401k style system. Politicians have proven time and time again that they are unable to manage the funds and have succumbed to pressures from public sector unions to overpromise benefits, thus enabling an unsustainable system at the state and local levels at the expense of hard working taxpayers. The situation in Harvey comes as no surprise and will be the first of many towns in Illinois who are close to arriving at the same fate. For years, political corruption, over promised benefits, and missed payments have contributed to the financial disaster in our state and has spread to cities like Harvey and several others to follow. The state’s political ruling class has gone unchecked for decades working against Illinois families and lining their own pockets. The ruling class has failed to manage their core government responsibilities and continues to look to struggling Illinois residents to bail them out of their own fiscal failures. State lawmakers have no other choice but to enact legislation to allow local units of government to file for bankruptcy. The state must loosen its reigns over local governments and allow them to reform their finances, otherwise everyone suffers and Illinois will continue to lead the nation in outbound residents seeking to escape a confiscatory government.